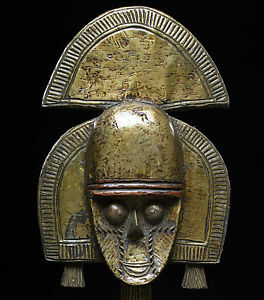 Types of Art: The masks of the Yaure represent human faces supplemented by animal attributes. They have an elongated face with a protruding mouth and pierced semi-circular eyes set under a high forehead. An elaborate plaited coiffure parted on each side, often with horns at the end, completes the image, while the outline of the mask is characteristically surrounded by a serrated edge. The masks are considered emblems of yu spirits, very dangerous; they have to be handled with extreme caution. Cases of death that jeopardize the social order are the principal occasions for an appearance of masqueraders. By means of their dance, they restore the social equilibrium of the community and accompany the deceased into the ancestral realm. These masks are worn predominantly on two occasions: the je celebration and the lo ceremony. The first purifies the village after a death and helps the deceased's soul on its way to a final resting place. Painted masks are mainly worn by dancers during this ceremony, while for lo funeral ceremony masks covered with black pigments appear. Women may not participate in funeral ceremonies, neither may they look at the masks, for fear that this encounter with death might jeopardize their fecundity. This means that before starting the village�s purification rituals related to a death, for prudence sake the women are gotten out of the way. With the aid of such masks, the people hope to influence supernatural powers, or yu spirits, that can do harm to humans, but that can also ensure their welfare. The function of each type of mask is not rigidly fixed, which leads to their appearance during either ceremony. Small Yaure statuettes are carved to protect and help in difficult situations. They have realistic features with the emphasis placed on the head. The Yaure use drums to announce the death of a chief.